A great opening night party courtesy of super sponsor Github ended Day One on a high note, and a live video chat with RWD evangelist Ethan Marcotte made for a fantastic start to our Day Two. We got great feedback from workshoppers, and we had a great time ourselves. Thanks for having us, Columbus! Build Responsively Columbus slides can be found on Speakerdeck under Ben’s profile. 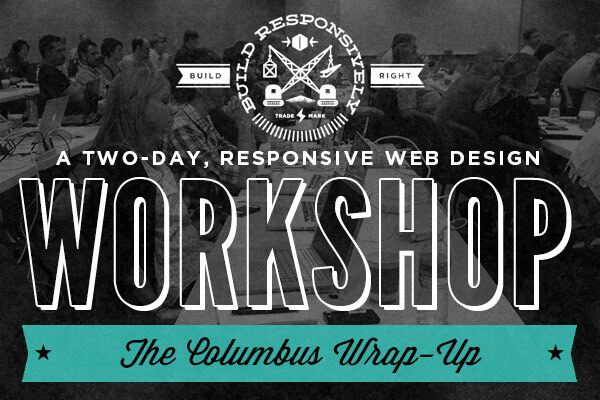 Be sure to check out our busy August schedule of Build Responsively workshops throughout the Midwest. Pittsburgh, Cleveland, and Grand Rapids, here we come! We’re also more than happy to give an additional shoutout to our amazing group of sponsors. Rosenfeld Media and A Book Apart provided some must-have books for workshopper give-aways. Adobe graciously gave away a copy of their essential Creative Suite 6. Github sponsored beers all around. And our friends at Applied Information Sciences came through to support the workshop as a whole. Thanks for making it happen!